The opening image summarizes the desolation and despair of common people torn from the security of normal life and thrown into turmoil. 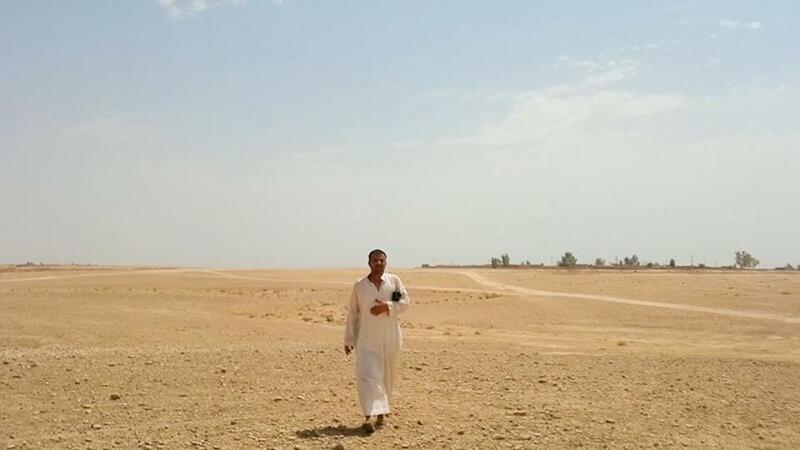 A haggard, solitary man in white, Nori Sharif, stumbles across a desert. His children are sick, he says, and there is no water. They are fleeing a war that seems to be raging everywhere. “We have to keep moving in order to survive,” Sharif says. Flash back three years to December 2011. Ahmed has just enlisted the help of Sharif, a nurse at a hospital in a part of Iraq that would soon come to be known as “the triangle of death.” The filmmaker gives Sharif a camera and asks that he use it to record the people in his community telling their stories. The situation at the time is relatively stable and peaceful. People are poor but comparatively safe and can provide for their families. At Sharif’s request they tell past tales of horror and death, showing scars of trauma, both physical and mental. But Sharif himself is optimistic. He is secure in his job, his wife and four children are safe and happy, and his spirit is light enough to teach a shepherd boy whom he’s filming how to dance. More importantly, the US occupation has ended, and people are celebrating their new freedom and independence. Iraqi troops in pickup trucks shooting their guns in celebration jam the highway. But this jubilation is short-lived. The government reveals itself as corrupt and oppressive. The terror of ISIS looms over them. Sharif is a paragon of decency and endurance, but his camera skills are limited and often constrained by circumstances. For the most part this roughness reflects the raw immediacy of the experience. In one initially amusing, then chilling sequence he hands the camera to his young daughter. After giving her some cursory instructions (“hold each shot for 10 seconds”), he tells her not to miss shooting the ISIS banner hanging from a building. The film is also patchy, as three years pass in less than 90 minutes of film time with uneven continuity. Much of it consists of Sharif or others talking about what has happened to them, not showing it. Perhaps that is a blessing, as some of the images shown — the aftermath of a suicide bombing, injured children — stick in the mind, and there’s nowhere to hide. Directed by Zaradasht Ahmed. 86 minutes. At the Museum of Fine Arts, various dates Dec. 3-16. Unrated (graphic war footage, palpable fear). In Arabic, with subtitles.